Blisters happen. Having dry feet and shoes that fit perfectly are the best ways to avoid blisters. That’s not always possible. On the AT I hatched a monster blister on the heel of my right foot. In that case I blamed my blister (named B.B. at one of the shelters in the Smokies) on the fact that my feet were constantly wet for the first 200 miles of the AT. 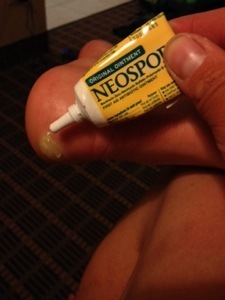 For hiking the PCT I employed all of the blister avoidance techniques I’d learned on the AT. I tried to keep my feet dry, I used my anti-chafing stick on my feet every morning, I used my favorite socks, I got boots that were plenty big, and as soon as I got any hot spots I covered them with athletic tape and that seemed to work really well for the first 200 miles or so. Despite all of my efforts I ended up with a big blister on the heel of my right foot at around mile 400 of the PCT this year. I knew that I had a blister brewing. To get shoes with a big enough toe box for my feet, the heel cup tends to be looser than it should be. At the beginning of the hike I was keeping my shoes laced tightly which seemed to be working perfectly to prevent my heel from lifting. Unfortunately, by the time I got to Warner Springs I was getting a little bit of bruising on the tops of my feet from having my laces tied too tightly and was worried that I might be creating a perfect storm for stress fractures. At that point I made a conscious decision… I was going to loosen my laces, increasing my risk of blisters but decreasing my risk of stress fractures. Blisters I can walk through, stress fractures would take me off of the trail. It was an incredibly easy decision for me to make. I would much rather have the blisters. Sure enough, within a couple of days I’d started developing blisters, but the pain on the top of my feet was going down, so I suppose that I’d achieved my goal. I treated the blisters with athletic tape, which was still working until… I ran out of athletic tape. Doh! I tried using duct tape and relearned what I’d learned on the AT… Duct tape doesn’t stick to my feet. 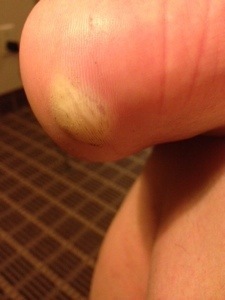 The blister got bigger… I tried using moleskin… It didn’t stick, the blister got bigger. In a desperate last ditch attempt I tried covering it with a bandaid…and the blister got bigger. When I made it into town next I needed to do two things… Pop my blister and buy more athletic tape! 1. Head into a town or hostel where you can take a shower and prepare a relatively clean environment. 3. Sterilize a needle. On the trail I carry safety pins and use one of those as a needle and I use the lighter I carry to heat the pin until it’s red hot. You could also disinfect it with an alcohol wipe. 3. 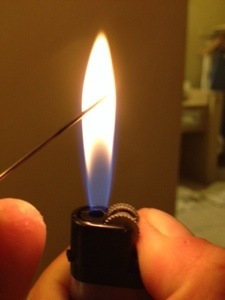 I then pierce the blister in two locations (one to act as a drain and the other to act as a vent or pressure release). *note: before removing the needle make sure you have a towel under you foot for when the fluid (just the plasma component of your blood, unless it’s a blood blister) comes gushing out. 4. After the blister is drained I apply antibiotic ointment to it. 5. If I’m a clean environment (a hotel or hostel) I the leave the blister uncovered overnight so that it can dry out and toughen up a bit. If I’m on the trail (I still deal will my blisters at night so that they get at least 8 hrs of rest before I retraumatize them) I put on a pair of clean socks to wear overnight (town clean not hiker clean). 6. 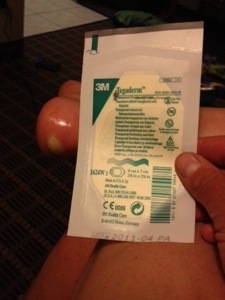 The next morning I reapply antibiotic ointment and then I cover my blister with tegaderm to protect it. I then cover the whole area with athletic tape as usual (since it’s the only thing that sticks to my feet and it holds the tegaderm in place. And that is how I deal with my blisters on the trail!